Protecting the security and privacy of your personal data is important to MORRIS PAINTING TOOLS & SPRAYS. In the following, we provide information on the kinds of data we collect on these MORRIS PAINTING TOOLS & SPRAYS websites, the purposes for which we use such data, and the parties with which we share such data, where applicable. The goal of this Privacy Notice is to advise you of the online privacy practices of MORRIS PAINTING TOOLS & SPRAYS and to describe the choices you have about the way the information collected on this site is used. MORRIS PAINTING TOOLS & SPRAYS’ primary goals in collecting personal information about you are, first, to give you a meaningful, enjoyable, and personalized website experience and, second, to facilitate the development of new products and services relevant to consumers like you. Personal information also allows us to provide better service to you by tailoring our communications to match your interests- deliver more of what you want and less of what you don’t want. In order to establish your account, register for newsletters, or to participate in various online programs offered through MORRIS PAINTING TOOLS & SPRAYS, you will be asked to provide certain personally identifiable information to us such as your name, mailing address, e-mail address, and phone number. You can choose not to provide this information but then you might not be able to participate in some of our services or offerings. If you provide us with personal information, we may place you on company’s email list and receive e-mail regarding product updates, special offers, important issues and new products. If you do not wish to receive e-mail updates, unregister from our list. Our web servers may automatically monitor the number of visitors, the average time spent on the site, the popularity of our Websites, and any programming errors or failures on any of our Websites in order to determine the effectiveness of the MORRIS PAINTING TOOLS & SPRAYS. Google Analytics™: MORRIS PAINTING TOOLS & SPRAYS uses Google Analytics, a third-party web analysis service provided by Google Inc. (‘Google’). Google Analytics uses “performance cookies” to analyze how you use the website. We may share statistical or aggregated non-personal information about our users with advertisers, business partners, sponsors and other third parties. This data is used to customize MORRIS PAINTING TOOLS & SPRAYS website content and advertising to deliver a better experience to our users. Insofar as you have provided your consent or when we are otherwise legally entitled to do so, we will share your personal data with subsidiaries of MORRIS PAINTING TOOLS & SPRAYS, where applicable, for the purposes indicated above. MORRIS PAINTING TOOLS & SPRAYS reserves the right to disclose user information in special cases, when we have reason to believe that disclosing this information is necessary to identify, contact or bring legal action against someone who may be causing injury to or interference with (either intentionally or unintentionally) our rights or property, other MORRIS PAINTING TOOLS & SPRAYS website users, or anyone else that could be harmed by such activities. We may disclose personal information without notice to you in response to a subpoena or when we believe in good faith that the law requires it or to respond to an emergency situation. MORRIS PAINTING TOOLS & SPRAYS encourages parents and guardians to monitor and participate in their children’s online activities. Unless you are viewing a website directed specifically to children, no information should be submitted to this site by users under 18 years of age, and users under 18 years old are not allowed to register for newsletters, clubs or activities. In addition, users under 18 years of age are not allowed to make purchases or participate in contests, except for those specifically directed to children. Where appropriate, MORRIS PAINTING TOOLS & SPRAYS may ask you to indicate your age to verify compliance with these policies. 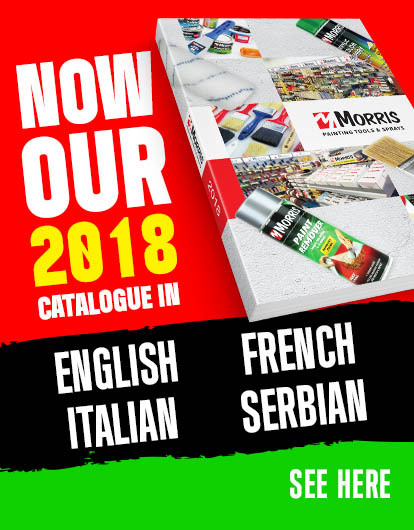 MORRIS PAINTING TOOLS & SPRAYS does not knowingly collect information from our guests under 18 years of age or provide any personally identifying information from such guests to any third party for any reason whatsoever. We do not allow guests known to be under 18 years of age to receive direct marketing communications from MORRIS PAINTING TOOLS & SPRAYS or from third parties. Please be advised that our website may contain links to third-party websites. The linked sites are not under the control of MORRIS PAINTING TOOLS & SPRAYS, and we are not responsible for the contents or privacy practices of any linked site or any link on a linked site.